Today's network security threats have evolved into highly sophisticated assaults using multiple attack vectors to penetrate networks and steal valuable information. Industrial control systems face an increasing number of targeted attacks and are especially vulnerable to coordinated assults with the potential to cause wide scale outages. Traditional security solutions are intended for an office environment and are not designed to operate in harsh conditions. The FortiGate Rugged-100C is an industrially hardened, all-in-one security appliance that delivers enterprise-class threat protection for securing critical control networks against malicious attacks. The FortiGate Rugged-100C is an industrially hardened, all-in-one network security appliance that delivers enterprise-class threat protection for your critical control networks. It meets required performance and reliability standards for operating in harsh electrical and environmental conditions, including high levels of electrical and radio-frequency interference and wide ambient temperature ranges. The FortiGate Rugged-100C integrates multiple attack recognition technologies into a single device, including firewall, IPSec and SSL VPN, application control, intrusion prevention, antivirus, antimalware, and web filtering. FortiGate Rugged-100C meets required performance and reliability standards for operating in the demanding substation setting. It is designed to operate reliably in harsh electrical and environmental conditions, including high levels of electrial and radio-frequency interference and wide ambient temperature ranges. With limited access and remote resources, security solutions for industrial control networks must be simple to install, connect and maintain. The FortiGate Rugged-100C installs in minutes, automatically downloading regular updates to protect against the latest viruses, network vulnerabilities, worms, spam and phishing attacks, and malicious websites with no administrator intervention. 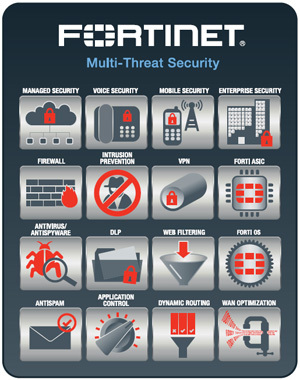 Fortinet's market-leading security technology and research results in appliances providing unmatched protection against today's sophisticated multi-vector threats. The FortiGate Rugged-100C integrates multiple attack recognition technologies into a single device, including firewall, IPSec and SSL VPN, application control, intrusion prevention, antivirus, antimalware, antispam, P2P security and web filtering. Simple per-device pricing, an integrated management console, and remote management capabilities significantly reduce procurement, deployment and administration costs. Ethernet Ports 1 - 2 - Gigabit Ethernet ports for connection to your network and the Internet. Ethernet Ports 3 - 6 - Fast Ethernet ports for connection to your network and the Internet. Download the Fortinet FortiGate Rugged-100C Datasheet (PDF).